An elderly woman came to us from South Boston in May with Mama Soleil, her two kittens, and a heartbreaking story. This woman had noticed that her downstairs neighbor, a single woman with five children, had an extremely malnourished cat that had been pregnant four times and was now pregnant again. The elderly woman offered to take the pregnant cat before she gave birth and care for the mother and her kittens, but her plea was ignored. Mama cat and her 5 kittens were all put out on the street in a box. Three of the kittens were nowhere to be found by the time the elderly woman found them, but she was able to rush the rest of the cats to CARE, where the cats were placed into a foster home. Just a short while later, a volunteer found 4 orphaned kittens locked in a crate in a dumpster. 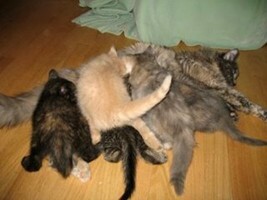 Miraculously, the kittens were saved in time, and even more miraculously, Mama Soleil adopted them as four of her own! Being the experienced and nurturing mother that she was, Mama Soleil raised all 6 kittens to perfect health, and all of them have found forever homes! Her only problem now is that she still does not have the loving permanent home that she so deserves. 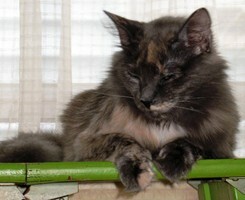 Mama Soleil is a very affectionate cat, who despite her maturity is still quite frisky and playful. 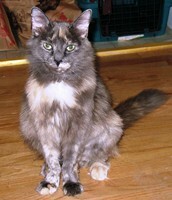 She is happy to become the center of attention in a single cat household, but would also do well with another young cat. A more detailed story about Mama Soleil and her adopted kittens can be found on our blog. If you are interested in adopting Mama Soleil, fill out an application here and we'll be in touch!